I love you guys, and you know what that means? Shhhhhhh–GIVEAWAYS! That’s right! I even paid for the stuff this time! So you’ll definitely want to stay tuned, especially if you like to *ahem* collect or trade small items with pokey things on the back ;). 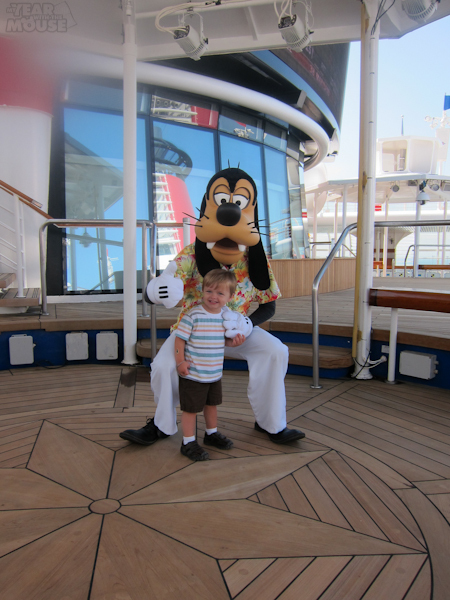 Goofy gives this picture a big thumbs-up! I love it! Though we’ve sailed the Dream twice and are boarding again a week from today, the Wonder is still my favorite Disney ship. I am so glad you said that (even though it’s now 2012 and I just happened upon your comment today on line). I’m going on my first Disney Cruise (Disney Wonder) in July (2012), just 3 more months and I’m really excited. My kid (8 and 9) don’t know and have been told that we’re just going to Disneyland for a few days in the summer (we live in California and are practically there all the time, so they’re excite but not as much as they would be if they knew we we were going on a Disney Cruise. I can’t wait when it’s time to finally break the news (after 7 month of planning and all). OMG that formal pic with mickey is adorable!!! Looking forward to more. That’s going to be our Halloween costume–Tuxedo Mickey! For Halloween we’re replacing the actual tux pants with a pair of red leggings and my mother in law is making a little hood with Mickey ears. It’s going to be disgustingly adorable. Love the pics! We went on the Wonder in February and had a blast. I don’t think I’ll ever go on a non- Disney cruise! Can’t wait to hear all about your trip! It will be nice to reminisce! We’ve been on a couple of cruises and really loved Celebrity for adults, but man, for kids there’s no beating Disney. Especially when your two are old enough for the Oceaneer clubs! Theo was just a bit too old for Flounder’s but too young for Oceaneers, but that program just looks so fantastic. Love the formal pic with Mickey. I’ve never been on a Disney cruise, only 2 Carnival cruises in my life but if I can force my husband into cruising one of these days, we’ll shoot for Disney (it would be fun especially if we had a kid or two with us by then, whenever that will be). The kids are the best part! Meeting tuxedo Mickey was the best :). 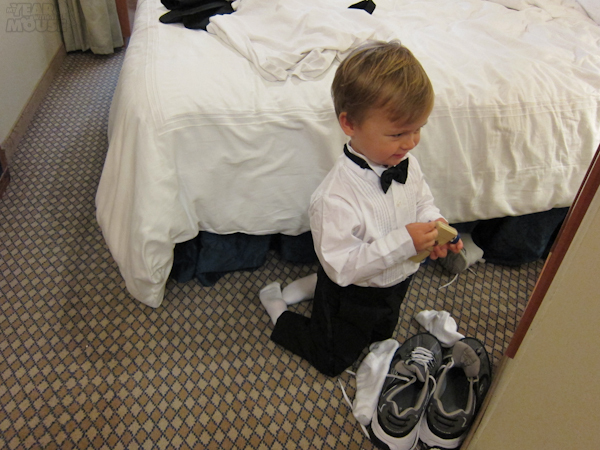 I’ll admit it–I picked the cutest pictures for the preview ;). Is that The Wonder? We’re sailing on the Dream in November, so excited! And now I need to check if the Dream has a formal night..
That is the Wonder! It was actually a “semi-formal” night but since we’re getting the tux for Halloween and Kevin already owns his own tux, I thought we’d all dress to the nines for fun :). 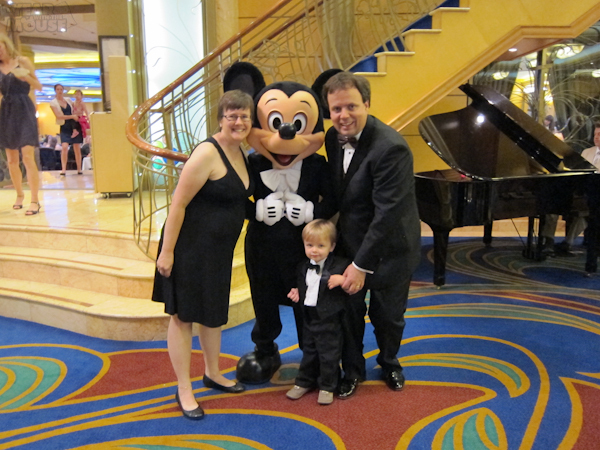 I believe any cruise 7 nights or longer has an official formal night (ours was 5 nights). The Dream looks really awesome–you’ll have a great time!